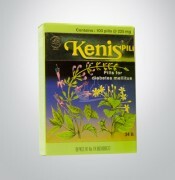 kenis 100 pill - Lowering levels of glucose in the blood. Active substance andrographolide is the main active ingredient in bitter that serves to reduce levels of glucose in the blood. containing karantin, momordisin and polypeptide (p-insulin) are effective for lowering blood sugar levels. Ortosifonin and potassium content of salt is the main component that helps dissolution of uric acid, phosphate, and oxalate in the human body, especially in the bladder, gall bladder, and kidneys in order to prevent the occurrence of kidney stones precipitate. Take regularly 2 times a day @ 5 pills. The dose may be increased or decreased as needed. Reduce foods that contain lots of starch and sugar. For people with diabetes who have been determined by a physician. During the use of your doctor on a regular basis.